Last week I joined more than 75 thought leaders from 20 countries working in civil society, academia, government, the private sector, and the UN who convened at IIE in Washington, DC, for the first international Working Forum on Women, Information and Communication Technologies and Development (WICTAD), co-hosted by the Department of State’s Office of Global Women’s Issues and UN Women. During the two-day forum, we explored opportunities for increased collaboration to expand women’s and girls’ access to and opportunities in information and communication technologies (ICTs). Ambassador-at-Large for Global Women’s Issues, Melanne Verveer, gave opening remarks at the event, stating that, “Technology is one of the highest potential ways to address development challenges. It is the great equalizer for women and we must improve access to ICT and close the Internet gender gap”. 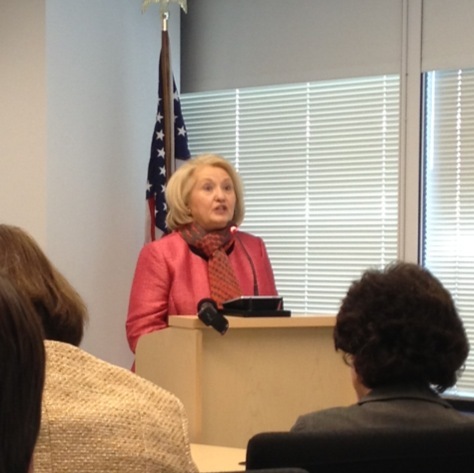 Ambassador Verveer highlighted the importance of programs such as TechWomen, an initiative of the Bureau of Educational and Cultural Affairs, managed by IIE, that connects emerging women leaders in tech from the Middle East and Africa to their counterparts in Silicon Valley through an exchange and mentorship program. During the opening plenary, Intel launched its new “Women in the Web” report. The report found that only 21% or 600 million women in the world are online today. The report set an ambitious, yet achievable, goal of doubling the number of women online to 1.2 billion in the next three years, which set the stage for the WICTAD discussion groups. Opening panels included representatives from Grameen Foundation, World Bank, UN Women, International Telecommunications Union and GSMA. Following the plenary, participants worked in breakout groups to identify action items related to priority areas such as ICT Careers, Political Participation, Digital Literacy, Entrepreneurship and Content Production. On the second day of the forum, I co-facilitated an informal discussion with Ann Mei Chang, Senior Advisor for Women and Technology in the Secretary’s Office of Global Women’s Issues, about the Women Leading Women in ICT (WLW-ICT) commitment for the Clinton Global Initiative. The WLW-ICT is co-led by IIE, the Office of Global Women’s Issues and the Global Fund for Women and includes private sector, NGO, government and academic partners. Lastly, at the forum, I was once again reminded of the small interconnected world in which we live and the impact of programs such as Fulbright (administered by IIE on behalf of the US Department of State). I had the great pleasure of meeting Dorothy Okello, Founder of Women of Uganda Network, Lecturer at Makerere University, Kampala, Uganda, and recipient of numerous prestigious awards in the ICT sector. Dorothy was a Fulbright student in the early nineties when she met my dear IIE colleague, Laurie Stevens. Laurie invited Dorothy to spend the Christmas holiday with her family after meeting her at a Fulbright pre-academic orientation in DC. 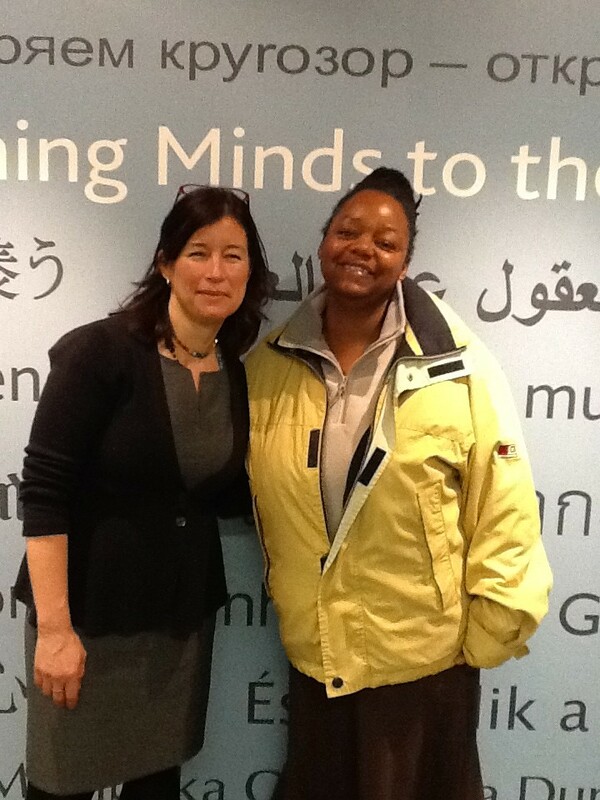 Spending the holidays with Laurie gave Dorothy a new understanding and appreciation of Americans and our diversity. Dorothy told me that she considered her Fulbright experience to be the launching pad for all that she has achieved since. Heather Ramsey with Dorothy Okello. This entry was posted in Tech Initiatives, Washington, Women's Initiatives and tagged Ambassador Melanne Verveer, Empowerment, IIE Washington DC, impact, Information and Communication Technologies and Development (WICTAD), Intel, Leadership, TechWomen, U.S. Department of State, Women, women in tech, womenintech by TechWomen. Bookmark the permalink.